Box Dimensions (LxWxH) 9.8 x 5.8 x 2.7"
WP-570 Waterproof Case is rated 3.0 out of 5 by 26. Rated 4 out of 5 by Anonymous from Works as expected --- had a great time! I was a bit uncertain at first about the DiCAPac for my LX-5, but I was positively surprised. It's not the same has having a pro underwater casing or camera, but it really performs as described. Great fun with it in Hawaii. The controls are a bit difficult to reach, and it vignettes a bit on 24 mm-e, but setting the camera in P at 35 mm-e it is almost perfect. The lens extends and it blocks the camera nicely; the screen is not so visible but hey... it works. Rated 4 out of 5 by Anonymous from No longer scared of water I fly fish rivers and lakes by wading or paddling in a float tube. I alway carry my canon g10 but was scared of getting it wet. No more...with my dicapac I don't have to worry out that. I can photograph my fishing trips or even video now. And it works just as well as those cases that cost 5 times as much. I would recommend this to anyone. Rated 5 out of 5 by Anonymous from Great inexpensive case I just got back from a snorkel trip in Cozumel. I used my Canon IS 250 digital camera in the WP-570 waterproof case. It fit perfectly because I made sure I looked at the compatibility chart on DICAPAC website. I strongly advise to consult that chart to make sure you buy a big enough case for you camera model. The case worked very well, the camera was bone dry after my snorkel. I took it to the depth of 15 feet with no problem. It was kind of hard turing the camera dial to change from picture mode to video mode but I managed. Do not forget to empty as much air as possible before sealing the case, it helps the case not to drag you back up when you dive. The only criticism I have is it does not cut the glare. If you are in the water on a very sunny day, you will get so much glare you will not be able to see the LCD screen well. Rated 1 out of 5 by SeeYouOnTheRiver from Not a good choice for rx100 I bought the Dicapac waterproof bag for my RX100 and tried it out kayaking on the river today. The bag is poorly designed so that the end that rolls up is on the right hand side blocking the shutter button and zoom control. If you try to put the camera inside the bag upside down to avoid this problem, then the stiff seam in the bottom of the bag blocks the shutter. It is impossible to operate the camera one-handed with this bag. Often when shooting from the kayak, I need one hand free to hold my paddle or hang onto a rock in the middle of a rapid. The rigid tube which holds the window is not big enough to go over the control dial around the lens on the camera. Because of this, the camera lens does not stay lined up with the tube. When you turn the camera on, the lens tries to extend and jams, restarting several times. Because the lens does not stay centered well, the edge of the window shows up in some photos. Many buttons and control dials are not usable through the bag. It is barely possible to actuate the shutter and zoom control. Other buttons such as the movie rec button are easily actuated by accident just handling the bag. Water drops are a big problem on the window. I usually bring a piece of chamois to clean the drops off before shooting, but I forgot to take it with me today. The screen is difficult enough to see in bright light without the bag. The shiny vinyl of the bag makes it even harder to see. Rated 3 out of 5 by Anonymous from Practical item Quite satisfied with the quality of the photos. We had a very strong rain fall and flooding in the area, so I tested the case in that conditions. Attaching 2 photos - one with the rain pouring over me and very strong wind and the other one, managed to hold the raincoat over the camera (in the case), so to avoid the drops. Tested it in the pool (under the water) as well - very clear photos (sorry have deleted the test shots). I have Panasonic TZ30 - fits perfect. Overall - happy withthe product, pls note very hard to manipulate the settings. Rated 4 out of 5 by Happy Aunt from Clear and dry I got this prior to a trip to Niagara Falls where pictures would be taken under drenching conditions. I did put a paper towel in the bag to test the waterproof nature before I used it though, and was satisfied that it worked. Because of the optical lens in the product, my pictures came out just as clear in quality as when this pac is not being used. You do have to remember to wipe water droplets off of the pac lens every so often though, in order to keep the pictures clear. I kept a soft paper towel in my pocket for that. It's only getting a 4 star rating though because the stiff plastic did make it a bit more difficult to use various camera buttons, especially when those buttons are right next to the sealed up end of the pac. Granted, the plastic has to be tough enough to remain impenetrable despite applying pressure against metal ridges of camera buttons. And every time my camera's lens receded when I turned it off, I had to check to be sure I had the camera in the right place in the pac before I could turn it back on so the camera lens could come back out. Occasionally, and not surprisingly, I did get black arcs in my pictures because I didn't always have my camera lens pressed up to the front of the pac lens. But it was worth having for this trip and for future water related events because everything did stay dry and I could take as many pictures as I wanted with a variety of camera settings, unlike with a cheap film type waterproof camera. I have lots of good pictures. Definitely worth it. Rated 4 out of 5 by Stuart from Works well for what it is Works well with my G15. Be sure to squeeze out some air before sealing it. Also be sure to hold the camera into the case lens or you might get the case's lens showing up in your video or photos. Will this case work for the Panasonic Lx100? Hi Shaun, I believe it will work. You have also to certificate that the waterproof case lenses won't be in front of your camera lenses, it happens to my camera sometimes, you have to hold the waterproof firmly so it won't be in front of it. Hope I've helped you, Thais. Will this work with Canon powershot sx410 is? The Canon PowerShot SX420 IS camera will fit in the DiCAPac WP-570 Waterproof Case. The zoom range will be limited. Hi, is this the correct case for a Canon PowerShot SX260 HS? how sharp are the photos? The LUMIX DMC-LF1 will not fit in the DiCAPac WP-570 Waterproof Case. 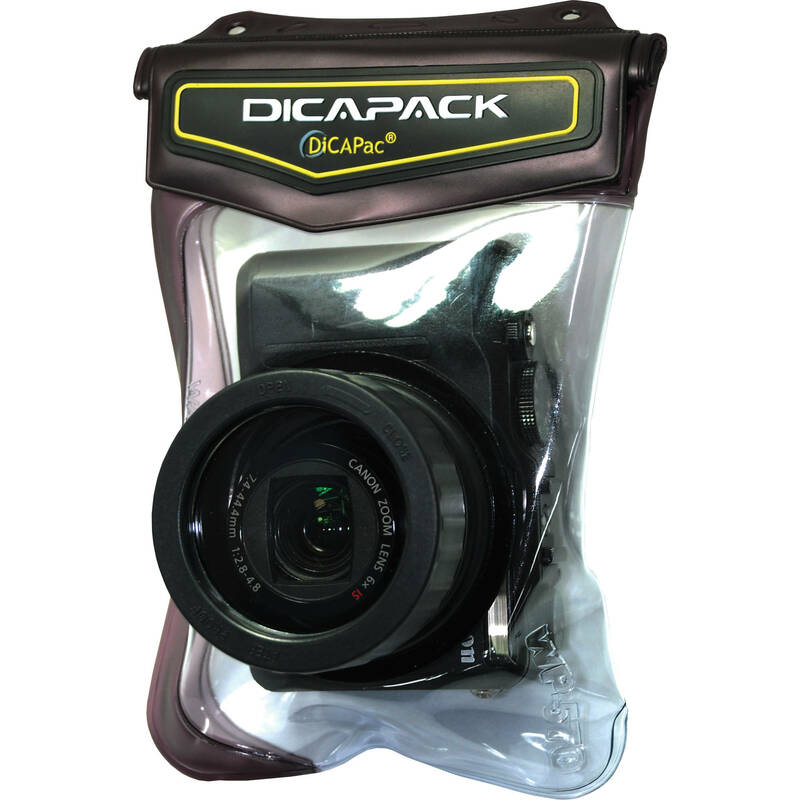 DiCAPac recommends the WP-S3. Does the WP-570 fit a Canon PowerShot SX720 HS? The Canon PowerShot SX720 HS will not fit in the DiCAPac WP-570 Waterproof Case. There is not enough space for the camera lens to operate correctly. The camera will fit in the DiCAPac WP610. Does it fit for a Samsung WB350F? Thanks. Don't know. I used it with a Cannon G-10. Will this work with my Panasonic LUMIX DC ZS 200? Not sure. I have DC-ZS-70, I didn't have full zoom capabilities while in case.